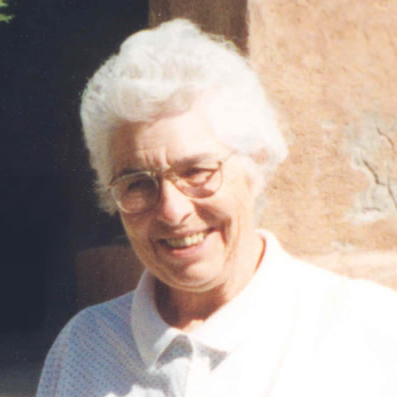 Belen, New Mexico was Sister Rita Barreras’ home and she ended her active ministry as the last Grand Rapids Dominican to serve there. Born November 6, 1928 and baptized Rebecca Dolores, she was the first of three children of Rafael and Cleotilde Barreras. Her father, who had gone to work at the age of ten so that his sisters would have shoes to attend school, taught himself to read and write in Spanish and English. He worked a night shift in order to have his days free to serve the parish as sacristan. In his later years he was recognized as a special friend of Catholic education and a faithful contributor to the diocesan school fund. Two of Rebecca’s aunts were Dominicans, Sisters Eloysa and Bernadina Garcia. She also had Dominicans as teachers at St. Mary’s School in Belen, where she attended for seven years. There she also studied piano and tap dancing, which she dearly loved. From grades eight through twelve she was a boarding student at St. Vincent Academy in Albuquerque under the Sisters of Charity. The influence of her aunts brought Rebecca to Marywood as a postulant on September 6, 1947. She received the habit March 11, 1948 and the name, Sr. Mary Rita of the Sacred Heart of Jesus. She made her first profession on June 1, 1949 and her final vows on August 5, 1952. Sister Rita had begun her education at Aquinas College in 1947, but like most members of the Congregation at that time finished it on the 20-year plan through summer school and correspondence courses from several universities. Meanwhile she taught primary grades in Alma, Hannah, Gaylord, Pewamo, Grand Rapids, East Tawas, and Kingsley. In 1968 Sister Rita was assigned to Ranchos de Taos, Santa Cruz, in her native state and then when her mother became ill, back to her home parish, Our Lady of Belen for 23 years. There she taught three nieces and one nephew. In 1994 she relinquished school assignments to attend to the needs of her widowed father. By the time of her Golden Jubilee in 1998 her father had died and she was living in community with four other Dominicans at the new House of Presence in Albuquerque on Adams Street. She volunteered at San Jose Parish, taught religious education and English as a second language, helped the elderly in shopping, and sometimes baby-sat for her grandnephew. Sister Rita found her life as a religious meaningful and enjoyed each situation as it came. When needed, she served as an organist and choir director, art teacher, or cook. Always she liked getting together with the Sisters – until at the end of her years in Belen she was the only one left. Twice, however, Sister Rita experienced deep suffering. The first occurred near the end of the summer in 1974. She was driving her aunt, Sister Eloysa Garcia, to purchase supplies for her new Arts and Crafts Center that was to open on the old cottage on the Marywood grounds. At a busy intersection their car was hit by a truck. Sister Rita escaped with cracked ribs, but Sister Eloysa had several serious breaks and needed a tracheotomy. For a week she remained in intensive care before dying on August 4, 1974. Sister Rita was grateful for the “tremendous and powerful support” she received from the Sisters, which enabled her to cope with her feelings. In 1999 Sister Rita experienced another painful change in her life. A tumor was discovered on her brain and surgery was imperative. She was flown back to Grand Rapids and underwent surgery and chemotherapy. In August of 200l she had recovered and returned to live with other Dominicans in Albuquerque. Unfortunately, the tumor reoccurred and Sr. Rita became a permanent resident of Aquinata Hall. On January 9, 2005 Sr. Rita completed her lifelong journey from Belen, Spanish for Bethlehem – the House of Bread, to be with the eternal Bread of Life. The season of the seed. Sown in the Human Heart. How shall the fruit be sown? was enshrined in her darkness. Advent is the season of the secret . . .
of divine life growing in silence. of growth . . .
Sr. Rita is survived by her brothers Ralph (Jean) Barreras of Belen, New Mexico; Orlando (Eloisa) Barreras of Clovis, New Mexico; nieces, nephews, many friends and a loving Community.